European Internet Coregulation Network, Protecting minors from exposure to harmful content on mobile phones (προστασία των ανηλίκων από την έκθεση σε ζημιογόνο περιεχόμενο μέσω κινητών τηλεφώνων), Ιούλιος 2005, 14 σελ. David Graham and Associates Limited, Impact Study of Measures (Community and National) concerning the Promotion of Distribution and Production of TV Programmes Provided for under Article 25 (a) of the TV Without Frontiers Directive. 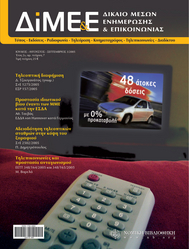 Final Report, Μάιος 2005, 239 σελ.